The 2K to 10K betting challenge continues on Sunday fron Naas in Ireland . The betting bankroll stands at £2193 (+£193),after really frusrating day on Friday at Newmarket,with Mrs Sippy gettting chinned on line ,after trading 1-9 in running . The other Selection Laugh Aloud also traded short 1-7 in running having looked allover the winner two furlongs out ,though stopped quickly in closing stages ,only finishing fourth . 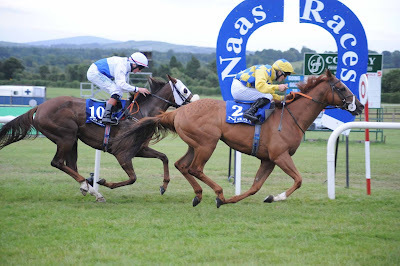 Moving on to Sunday ,we have 2 mile group three contest from Naas .Not the strongest looking staying contest ,though still looks interesting race .8 runners declared for Loughbrown stakes at 2.55 on ground described as good . The three main contenders are Twiglight Payment ,Falcon Eight & Victory Salute . TWILIGHT PAYMENT : 5-Y-0 Bay Gelding .Consistent sort ,winning 3 out 17 .Been in fair form this season ,winning l4f listed race at Down Royal in July.Also finished creditable 2nd behind Flag Of Honour in St Leger trial at Curragh in August .Ran as well as could be expected in Irish St leger earlier this month .Will suited by this drop in class . FALCON EIGHT : 3-Y-0 Bay Colt ,winning 2 out 2 .Lightly raced sort ,winning both starts in good style ,including winning small 11f conditions race at Killaney in August .Takes big step up in class ,though looks open to plenty improvement over this longer trip . VICTORY SALUTE :3-Y-0 Chestnut Colt,winning 1 out 4 .Won 10f maiden at Cork in June .Also finished fair 4th in Curragh Cup & Bahrain Trophy at Newmarket .Looks open to improvement over this longer trip .Each-way claims . VERDICT : TWILIGHT PAYMENT looks solid having been contesting most of the top staying races in Ireland this season.Will be suited by this drop in class ,having chased home the useful Flag Of Honour on his last two starts .Odds around 10-3 look fair value . Falcon Eight is not easy to weigh up, having won two minor events in good style ,though this is big step up in class and still has to prove himself over this 2 mile trip .Looks interesting prospect ,though odds around 2-1 look poor value . £44.00 EACH-WAY @ 10/3 BETVICTOR,BET365 .